To quote former President Ronald Reagan, "There they go again..." In this case, it's not the News Media but the Sports Media that has found yet another way to twist the normal rules of logic to support their favorite team. Maybe this is what Mark Dantonio meant when he said, "It will never be over." Michigan was a heavy favorite against Minnesota tonight, expected to roll to an easy victory with a point-spread in the mid-teens. Then suddenly, the Gopher Head Coach RETIRES in the middle of the week, an event which surely might have the effect of ending all hopes for Minnesota football this season. But not to the UM-loving sports media! According to their reports, the abrupt retirement of Jerry Kill now means the Wolverines have their hands full with the Gophers, their backs against the wall, facing the juggernaut of a team that just lost it's leader. Really? To show how stupid that line of thought actually is, let's turn the paradigm around. would that improve UM's chances of winning? Most people would say Michigan is only doing well because of their Head Coach, and if he suddenly left the team, they would be left rudder-less, floating aimlessly towards mediocrity. But since Harbaugh said it was so, the sports media has accepted The Word of their Savior, and they have approved of his message. Beating Minnesota tonight is now Mission Impossible, so UM is fully protected in case they lose, and they can be fully heralded if they win. and of course, they win-if-they-lose. It's truly a Beautiful Bias. Michigan was a heavy favorite to beat Michigan State two weeks ago, so if UM won, they proved their greatness. But if UM lost, they are still "fine" because they are "ahead of schedule" and of course, because Harbaugh is the Coach and what could be better than that? Once Michigan lost to MSU, their record dropped to 5-2, effectively eliminating them from so-called "playoff-contention", but actually not-so-much. UM is still "in the conversation", the only team in America with two losses getting such attention. And why? Because they actually beat the Spartans, get it? Their 5-2 record is as good as 8-0 in the eyes of the sports media. Looking ahead to Ohio STATE, Michigan is now considered a contender to beat the Buckeyes, even though OSU is 23-0 in the last two seasons, while UM is 10-9 over the same span. Make sense? But I can only wonder, if Michigan was riding a 23-game win-streak, and Ohio State was only 5-2 this season, would anybody outside of Columbus consider the Buckeyes a serious challenge to The Great Harboni? Doubt it. It's an amazing experience to watch the so-called "professional media" fawn over one team so much, despite any amount of evidence for a contrary position. It certainly gets tiring to watch it play out, over and over and over. When will the sports media begin asking Urban Meyer if he's "rooting for Michigan" to win out before his team plays them? They've been asking that type of question to Mark Dantonio for the past nine years. Highly professional production of the week leading up to the "Plunder at The Pig House" game. Some great sideline and camera work on fans. Locker room celebration. Since the Spartans don't play this Saturday, why not take 22 minutes and check out this video? And... A bonus video. This video is the same format, but focuses on Jack Conklin, post Michigan week and Indiana game insider camera work. Michigan fans have spent their bye-week jabbering incessantly about how their favorite team could find a backdoor route into the four-team playoff before they're even eligible for post-season action. Six teams in the B1G have qualified for a bowl, but that exclusive list does not include the Wolverines. Michigan's road is about to get rougher as they increasingly leave Ann Arbor in the rear-view mirror. They have been heralded for going 5-2, as if most people didn't have them at least 4-3 to this point. How many really picked UM to be 3-4 after seven games, and why would they have done so? It was obvious they had a shot at somewhere between seven and nine wins, so a record of either 4-3 OR 5-2 was always most likely. In that sense, the Wolverines are still somewhere in their expected target zone, not necessarily "way ahead of" where they were reasonably predicted after seven games. Assuming they WILL NOT RUN THE TABLE, four more wins would give them 9 for the season, while three more would give them 8. (In other words, if they went 4-1 or 3-2 from here.) So, where are the losses, you might ask, since so many people have them either winning up to Ohio STATE or actually running the Buckeyes over on the way to a playoff berth. Michigan has played five of their seven games at home. They will play three of their next five on the road. One of their remaining home games is against OSU. It's reasonable to guess that UM might lose two or three of their last five games. If so, their final record with those outcomes would be either 8-4 or 7-5. The five remaining teams have a combined record this season of 25-13 (.658) while the seven they have played so far have a combined record of 32-20 (.615). UM's opponents can now prepare for them rather than guessing on a composite estimate based on the 49ers, Stanford, and even San Diego. So any coaching advantage is somewhat moderated moving forward compared to the first half of the season. that did not exist earlier in the season. The sports media are treating Michigan as if the last play against Michigan State didn't actually happen. (See: Matt Millen). All of their discussion and prognostications would make sense when talking about a 7-1 team with only an opening-day loss. 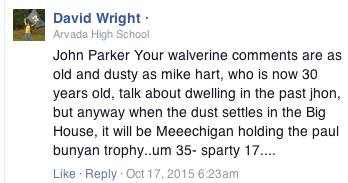 But the REALITY of the Wolverines is still not powerful enough to overcome the MYTHOLOGY of the Wolverines. Brady Hoke has a one-game lead over Jim Harbaugh at the seven-game mark in the First Year standings. Hoke took over UM in 2011, and was undefeated when Mark Dantonio gave him his first loss as Wolverine Head Coach. But Hoke finished 11-2 after starting 6-1. Harbaugh has already picked up his second loss, leaving no margin of error as he chases after the First Year record of Brady Hoke. Harbaugh has not yet been eliminated by Hoke. The Messiah can still deliver the Miracle. All he needs to do is run the table. With wins in each of the remaining five games, including Ohio State, Harbaugh would finish with the same 10-2 record that Hoke served up in his debut tour. Then, if Michigan can win their bowl game, the two coaches would finish in a dead heat for Season One. Sounds possible, right? Anything would be possible if you can walk on water, eh? So don't count the Harbster out just yet. A note about the rankings in this comparison. At the seven-game mark, Hoke's first team was 6-1 and ranked #18 in the country coming off a loss to Michigan State. At that same point this season (right now), at 5-2 and coming off a loss to MSU, Harbaugh's team holds steady at #15.
would "outrank" Hoke's 6-1 team? With all due respect for UM's ballyhooed start, they are currently playing survive-and-advance on the front end of what will have to be a six-game-win-streak if they are to MATCH UP TO THE STANDARD THAT BRADY HOKE SET in his first year on the job. 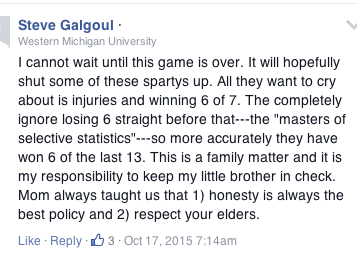 The Michigan fan-base continues to dwell on their latest loss, a 27-23 "upset" by Michigan State two weekends ago. The UM Coach says they've moved on to do battle with machine-gun-wielding worms, and the players say they're stoked up to turn the corner. But the lower elements of Walverine Nation continue to simmer about the so-called "gift" their team supposedly "gave to" our team on October 17. Well then. If they are going to keep stirring the pot, then we have some more ingredients to throw in. Remember that glazed look on Jim Harbaugh's face when the game ended, and continuing through the post-game press conference? (Of course you do, who will ever forget it!) He kept talking about "mistakes being made" and "not executing", repeating variations of both phrases several times the night of the game. Most people interpreted that commentary to mean he was pointing the finger of blame at one of his players, the punter who last touched the ball for Michigan. 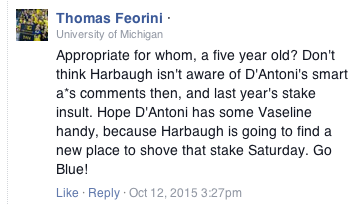 There has been little, if any, disagreement that Harbaugh "threw his player under the bus". Remember that post-game press conference after the B1G Championship game in 2011, the last play of which was a punt that resulted in a roughing penalty on an MSU player to let Wisconsin run out the clock? Mark Dantonio never said anything that made anybody think that he was trashing his player for what many viewed as somewhere between a reasonable mistake and a bad penalty call. Those are two very similar situations that led to two very different responses by two coaches. Harbaugh seemed to direct the blame at his player, leading to a public admonition of the UM fan-base to quit making death-threats to the poor kid. In contrast, Dantonio described the last play as part of a larger picture, an entire game comprised of more than 100 plays. 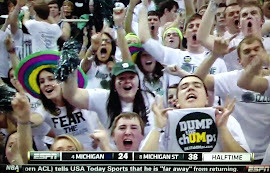 We sure saw a lot of chUMpy comments before the MSU-UM game, eh? Plenty were posted right here the past few days. 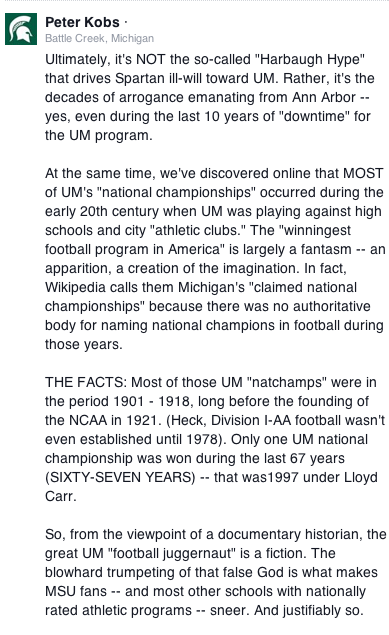 Some of those chUMps are still active online, blathering on about how the Spartans "didn't really win" the game, etc. ad nauseum. We will get to them later. 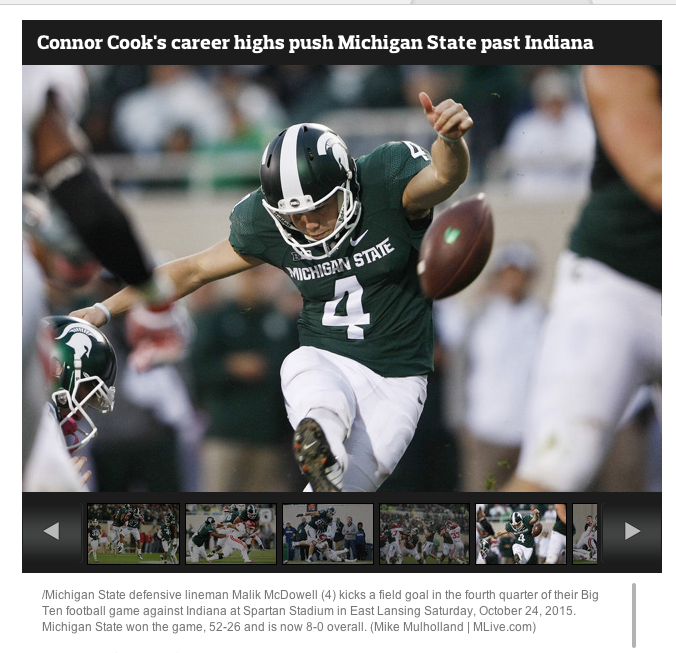 But for now, three things of note; two comments from Spartans, and a silly mistake by the sports media that shows their inattention to Michigan State sports. Great analysis, devoid of great big claims, yet filled with facts. This writer allows the reader to draw conclusions from information. Much better than the "call-and-respond" choir of the blue-bloods. 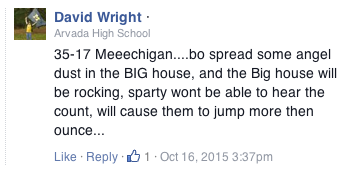 Anonymous Spartan comment. Once again, a fact-based style. The term "Notice a connection?" asks you to draw your own conclusion. Read the fine print in the original caption. Michael Geiger is described as Malik McDowell, because they wear the same number. But they are never on the field at the same time. We know that, somebody who wrote the caption didn't. David, you really have a firm grasp on the pulse of this rivalry. 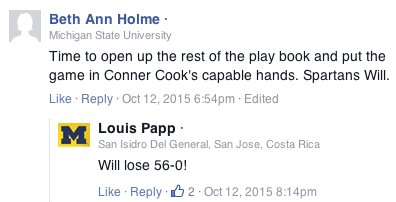 Louis, you missed on your prediction by a mere 60 points. Hey Tomaz Foroni, who is this "D'Antoni" of whom you speak? Whom did the "stake insult"? Possibly...UM? 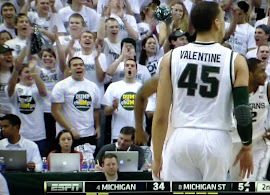 So, if MSU won the next 15 games, UM "still the big brother"? Okay, got it. Standard operating procedure. 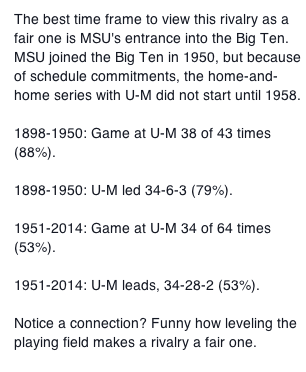 Would those "34 years to even up the series" all be games played in East Lansing? If so, the home-field advantage would then be leveled. Otherwise, not so much. 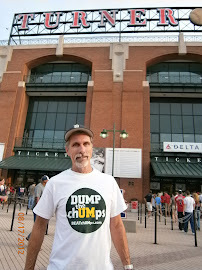 The chUMp comments posted above were taken from various articles from the Detroit Free Press and the Detroit News, as they both use Facebook systems for users to post their responses to what they read. So the names you see below have not been changed to protect the guilty; rather, they are being presented as an extension of their original appearance in the days before the 27-23 MSU win over UM. 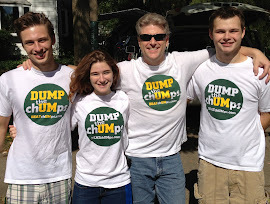 The chUMp NatiOn was left hungry after losing to Michigan State nine days ago, so we are offering to feed them their own words to settle down their blue bellies. 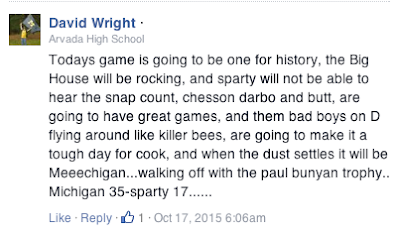 These are the words they threw around on the Internet during the days before the game in Ann Arbor. It's only fitting that they should have to eat their own words, right? Drew Sharp beats David Lewis, nobody is surprised. Your predictions have been wrong "more then ounce", David. Your anti-viral capabilities failed you, Edward. Your prediction was off by 27 points! Nooooooo, they didn't, Doug. But how 'bout them LAKERS!!! 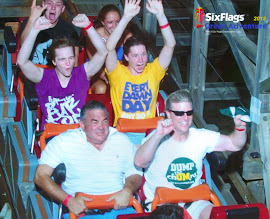 Enjoy your college days in Allendale. You came within 21 points of getting it right, Jerry. Maybe you should get back to Study Hall? There were so many words thrown around before the MSU-UM football game that they have cluttered the local atmosphere and they must be removed. The best way to get rid of them is to feed them back to their original owners, so we have been offering an all-they-can-eat word buffet for chUMps. Hope Terry didn't have to "Welsh" on any of his bets. Who is "dreaming of the old days" now, Terry? 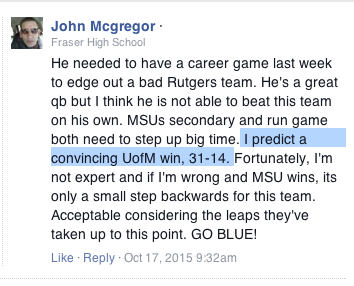 Congrats, John, you covered both possibilities in your "prediction". Then you excused your team in advance for losing. Got it. Standard operating procedure. 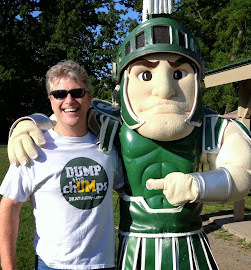 Are you enjoying your college years in Kalamazoo, Steve? Who would be "little brother" to WMU? You're right, David, the game was "one for history". Speaking of; shouldn't you be in history class right now? NOW FOR THE "GAME AFTER MICHIGAN"
WILL HARBAUGH "ORDER A HIT" ON COOK? MSU VOLLEYBALL WINS "STATE PRIDE FLAG"
HEY MICHIGAN: HOW DOES IT FEEL NOW?